Tai Chi/ChiGong will not meet during the summer. The classes will resume on Thursday, September 6, 2018 at 3:00 PM in Fellowship Hall. It will continue each Thursday at 3. Everyone is welcome. It is a follow-along class, so you can begin at any time. Tai Chi has been shown to be good for your health and good for your spirit. 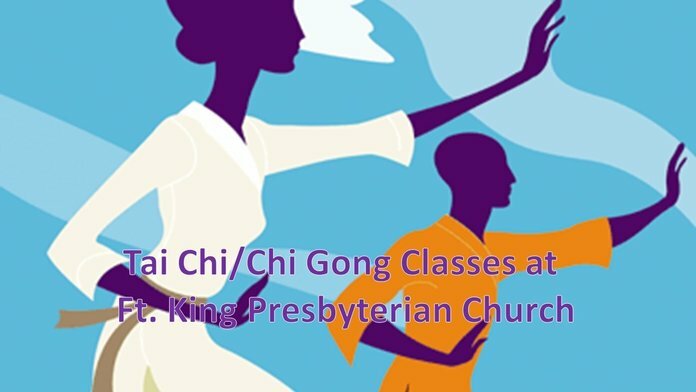 ​Tai Chi and Chi Gong classes are held in Fort King’s Fellowship Hall every Thursday at 3 PM. Everyone is welcome. Tai Chi and Chi Gong are simple ancient Chinese movements which are beneficial to health. The movements can be done standing – or seated. Medical studies have shown that Tai Chi and Chi Gong are good for balance, joint health, pulmonary problems, back pain, stress, and numerous other health issues. The movements are slow, and done with breathing and focus. Please join us! Do not be intimidated: the movements are easy to follow, and the classes are free.